I really enjoy the changing of the seasons (especially into autumn, my favourite) as it means I get to switch up my nail designs. In about three months I'll start craving summer designs again but for now I am really into my autumnal ideas. 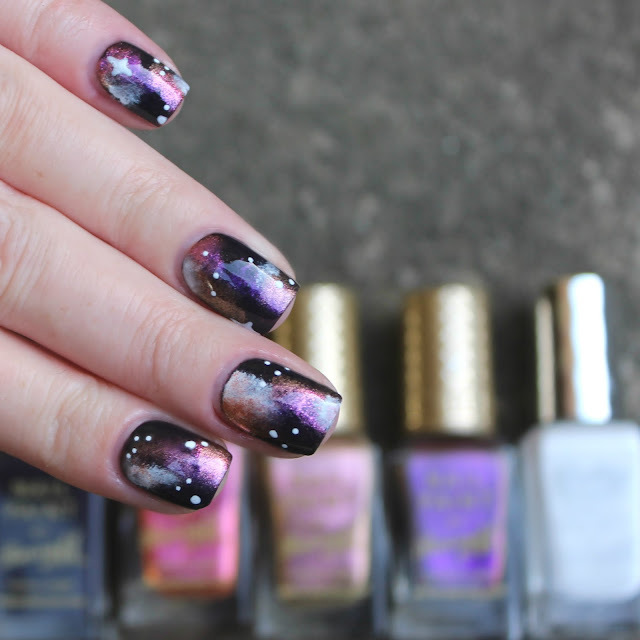 Galaxy is a look that works all year round but to switch things up for the darker nights I decided to go for a more autumnal palette with pinks and golds. 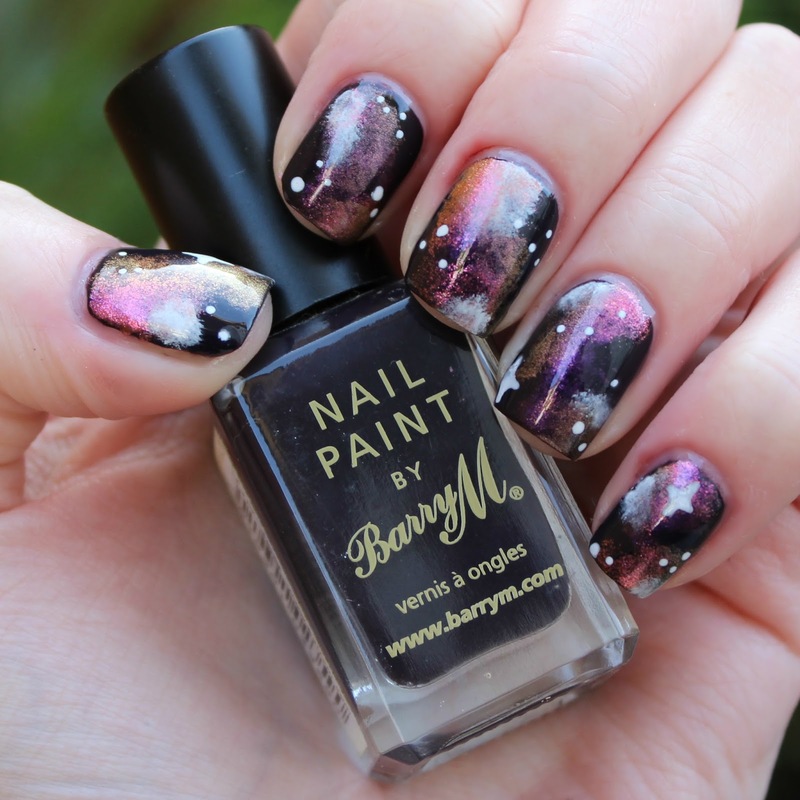 To create this look I used all Barry M polishes. I painted two coats of Nightshade* and when it was almost dry (I never wait for galaxy bases to fully dry because I am super impatient) I sponged on my other shades using a ripped make up sponge. The colours I used are: Persian*, Mediterranean*, Caspian*, and Cotton*. I love the shimmery effect of the Aquarium polishes. They give a really pretty edge if I do say so myself! 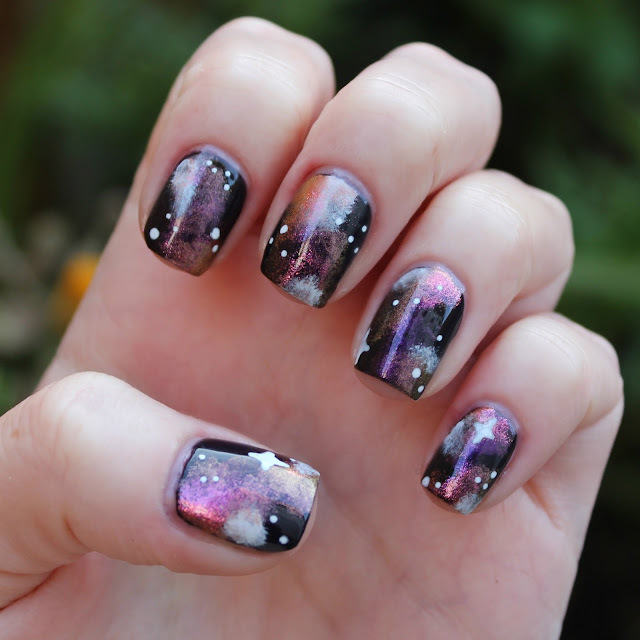 To finish the look I used a white nail art pen to draw some little dots and star shapes. I topped everything with a coat of Seche. Are you all enjoying autumn so far? I would be if the weather wasn't so miserable in London. I nearly died slipping over on wet leaves the other day. Not what I signed up for Autumn. Not at all.